Google now introduces a feature in its Google Maps called MyMaps. 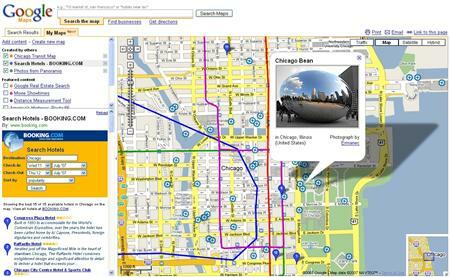 MyMaps allows users to create their own personalized maps. Users can plot anything on the selected locations. They can also select applications created by independent software developers and overlay data on top of this popular Google Maps service. For instance, users can use one of the map applications to watch YouTube video clips based on the locations where these clips were uploaded. Users can also link up famous photos taken in locations around the world to Google Maps. Of course there are many useful applications created by software developers. MyMaps is quite useful commercially and during daily life. Users can overlay multiple applications on top of Google Maps to find interesting geographical correlations for educational purposes. Users can also overlay information such as local crime statistics, transaction records, etc. on a new neighborhood while considering buying a house in that neighbourhood. Tourists can also use this service to check out photos posted by other tourists to sites such as Yahoo Inc.’s Flickr to figure out what the hotel or the surrounding region looks like before they make a reservation. Users are allowed to save their personalize maps if they have signed up with Google for Gmail account.s Those who don’t sign up with Googles can still use the service but they will remain anonymous.